As you may have encountered from reading this title, it is the season for asparagus. - 500g beef strips, or then you could get a hunk of meat and cut it in strips on the diagonal. So, firstly fill a medium sized saucepan halfway with water. Then boil it. While you wait, cut the asparagus* and meat (if not already cut). *To cut the asparagus, julienne diagonally in 1 to 2 inch strips. Leave the white ends on the end and chuck them in the bin. * Then when the water boils place the asparagus in there and set the timer for two minutes. After the timer goes off, drain it and pour cold water over the asparagus. This technique is called par-boiling, and is used to stop the vegetable from cooking, and is generally done when the vegetable is tender and not fully cooked. Then set the asparagus aside. Get out your wok, and turn it up to full bloom, poir oil in, and twist the pan so that the oil coats the sides as well as the base. Throw the meat in. Turn the wok down to a little more than medium temperature, and wait till the meat is just turning brown. While the meat is turning brown, cut the onion like a wizz-machine, then grate half the ginger and lemon. Now that you have your meat some-what done, and your asparagus also done, now is the time to join them all together is one awesome up-do! Pour into the wok some oil, the lemon rind and the chile flakes. Swirl them around for a minute on a medium heat plate. Then add the onion and ginger. Stir this concoction till the onion is caramalised, and not as stiff. Then add the asparagus, and gently fold. Lastly, add the meat and a tad of cream. (When I say tad, I mean pour a generous amount) Swish it around, and let it simmer for a minute or two. 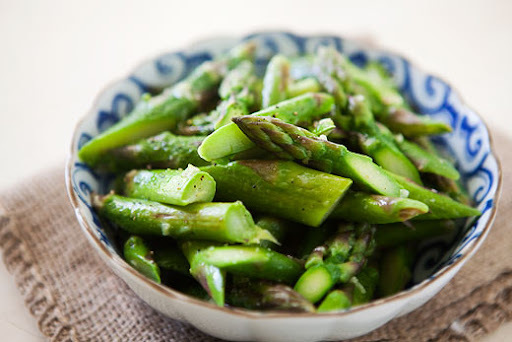 WHAM, the BEST asparagus recipe in the history of asparagus recipes.